Tangled and True: moses basket. I'm on the lookout for a moses basket for baby #3. I think this one looks nice. Suggestions welcome of great ones you've seen/used. I have not used a moses basket, but this one is lovely!! i'm thinking about a moses basket for our baby #4! babystyle has a really cute polka dot one that is top on my list. 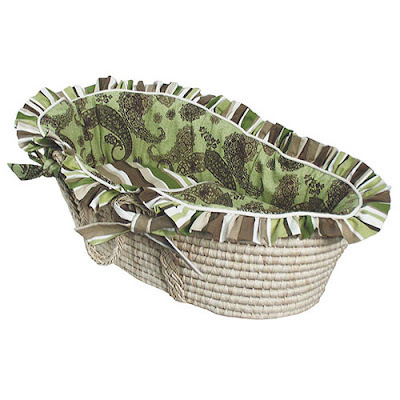 I purchased a plain Moses basket from a store in Vermont called, "Basketville" - thinking it only cost me $15. Then, I made my own cover for it. A cheaper and more custom made approach. If you are looking to get a moses basket then, you should definately look into getting a stand/rocker. I got one for baby #2 and I used my basket SO MUCH MORE than I did with my daughter. I liked it because it got the basket up off of the floor and it rocked, which I loved! and so did my son *grin*. I got mine from Simply Baby and Kids, this is there site. Just wanted to add that I used a moses basket for my 3rd, it was my first time going to the bassinet route and I was very happy. He's 6 weeks now and doesn't sleep in it as much but it was a life saver those first few weeks. We bought a second hand one on a whim ($5 - why not?) and I bought some new bedding and it was perfect! The best investment was the stand/rocker from JollyJumper.